Imagen obtenida del blog de Ángel Inda. After performing 37 years, the jota Singer, Alfonso Royo, will pass the torch to Iñaki Reta to become the masculine voice for the jota song “Ofrenda a San Fermín,” composed by Joaquín Madurga. Ana Patús will continue to provide the female voice, but it will be strange for her, as she will longer be accompanied in the duo by Alfonso Royo, who formed part of this musical duo ever since the inception of this annual procession song in praise of San Fermin on the 7th of the 7th of 1977- when he first sang the lyrics of Madurga. You can hear him singing here. 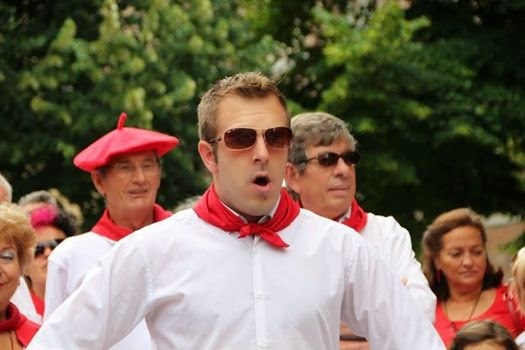 The next San Fermin procession this coming 7th of July, will see the 38th consecutive performance of the song as we have heard it year after year. The origin of this annual event and which is now such an emotional part of the procession for the public, goes back to the year 1975. That year, Joaquín Madurga and the Santiago de la Txantrea choir were invited to perform at the children’s traditional offering to San Fermín. Madurga composed this original piece which we now know as “Ofrenda a San Fermín” and he used a duo of jota singers to perform the piece. On that first occasion, Madurga had the backing of the Santiago choir and the duo who sang was made up of his sister Nieves Madurga and Migueltxo Ganuza. That first performance went down very well with the general public and Madurga and his people began to consider the possibility of singing to the saint every year at the same point along the route of the procession at the Plaza del Consejo. This was an open-air space and a point where there were not too many people gathered. On the 7th of July, 1977 the first performance took place here in what is now a traditional “spontaneous” performance of the “Ofrenda a San Fermín” piece which Joaquín Madurga had first written two years earlier for the children’s offering to the saint. The two performers chosen were Nieves Madurga and Alfonso Royo under the direction of Madurga himself. Later on, the conductor of the choir was assumed by Migueltxo Ganuza and the female voice was taken on by Ana Patús. Alegres cantad al santo sin par, con notas de alegría. ¡Excelso patrón, escucha esta voz y danos tu bendición! la que hoy te canta. la que hoy te ensalza. con tragos de bota por San Fermín. el pueblo celebra su san Fermín. al santo paisano quiere celebrar. Pamplona, Navarra, la tierra te canta. San Fermín en tu pañuelo se anuda gente del mundo entero. Son tus fiestas arco iris, con los colores del universo.